On a Saturday, what a better way to spend the day than to watch the ocean waves carry many celebrities on their surfboards. Yesterday, September 11, I drove to Malibu up the Pacific Coast Highway to just north of the Malibu Pier. It wasn’t easy, or cheap, but I found a place to park my car very near the day’s event. I was there for the Surfrider Foundation Celebrity Expression Session. 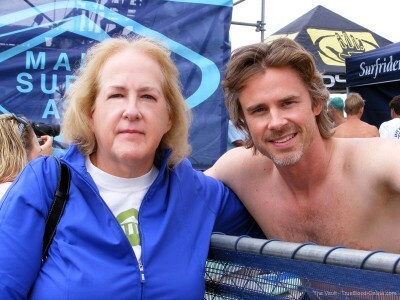 One of the celebrities attending was True Blood’s Sam Trammell and, of course, that was the main reason I went. To see lots more photos of this event and of Sam Trammell, visit the photo gallery. When I walked onto the beach it was still a bit cloudy, but very shortly the sun came out as I approached the tent where all the celebrity surfers seemed to be. I immediately came up to a low fence and there was Sam Trammell having his picture taken with a fellow True Blood fan, who’s name was Pinky. As he started to walk away, after they had gotten the photo, I called out to Sam and he came back over. I introduced myself saying I was also a representative of The Vault. He immediately knew what site I meant since he has met representatives from our site at both Eyecon in Florida last fall and at Bitten in August, in the UK. He said how grateful he was for how much support we give to the show and asked if I’d like a photo with him. Of course I did. I’ve met many of the True Blood cast, but this would be my first time meeting Sam up close and I can tell you it was a great experience. Like the others I’ve met he was personable, kind and generous with his time. A truly nice guy. Pinky with Eric Balfour and Me and Sam in the background. Martyn Lenoble and Christina Applegate hosted the Surfrider Foundation’s fifth annual Celebrity Expression Session at First Point, Surfrider Beach in Malibu. The 45-minute free surf gave celebrity surfers from music, film and television the opportunity to have some fun demonstrating their skills on Malibu’s famous point, while also raising money and awareness for the Surfrider Foundation. In addition to simply showcasing their surfing abilities, the celebrity contestants helped to raise money for the Surfrider Foundation. For every wave caught and ridden, event sponsors Cali Bamboo and Barefoot Wine donated $100 per wave back to the Foundation. 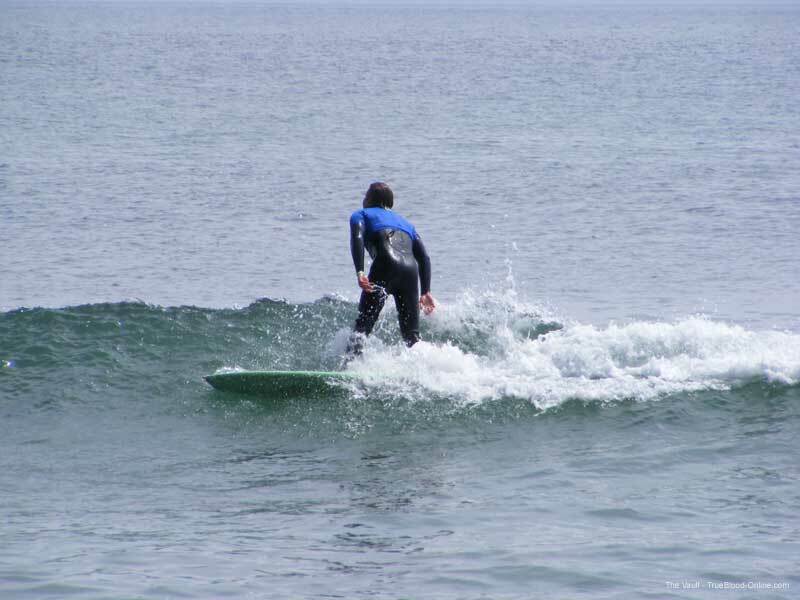 While the celebrities readied themselves to surf during high tide, which was expected precisely at noon, being front row center was great since I got to take lots of photos of Sam while he got into his wet suit and readied his surfboard. Then, the surfers filed out to the surf to wait for the sign that it was time to enter the water. The waves kept coming in closer and closer and for those of us wearing shoes (I’m still too east coast) we had to jump back each time the surf came in to keep from getting soaked. There were photographers from the press and lots of people on the beach, but it was a very casual group and quite respectful of the celebrities. Finally the call came telling them to go out and start surfing. Sam paddled out with the rest. He had to go out pretty far to catch a wave, but catch one he did. We got to see his surfing skills and he did a fine job. Once the 45 minutes was up, the participants all came out and marched back to the tents. What a better way to raise money than to do something you love, and they all seemed to have a great time. I have to admit that it was a lot of fun for me too and I would have enjoyed watching all the surfers, even if Sam wasn’t there, but I’m glad he was. I couldn’t resist not using this photo here, he is so cute!